When I discovered about 'Kookoo', the tracked cat back in May, I had no idea that I was going to work on a project to track dogs. And yet, I did. Admittedly, BT747 does not have a lot to do with it “as such”, but it does have a common ground: GPS technology. The Collar for Dogs has a GPS system and a GSM/GPRS on board. 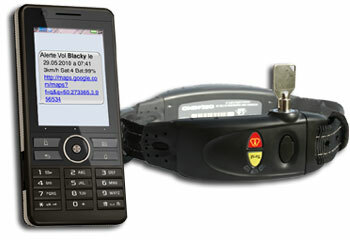 The GPS determines the position and the GSM/GPRS communicates it. In a hunting situation, the dog will just go after the prey following a path that the hunter himself can not follow. When the prey stops moving, the dog will do the same and both prey and dog may become “invisible” to the hunter. So the hunters put a RF beacon on the dog and look for it using an RF antenna. You can imagine how difficult that can be, so using the GPS Collar and a mobile phone, locating the dog becomes a lot easier. In uncovered areas, this GPS collar still has an RF emitter on board so that the older method can still be used. My contribution to the solution was to build the web technology to allow the configuration of the collar from a web interface and sending the corresponding SMS to the collar. Capturing the position and alerts sent through GPRS or SMS was another part of my mission. And finally, showing the current position on a Google Map was also quite important. All that is done now, and the first collars went out the door – luckily with my part of the solution working properly.